Ride Rough is the 2nd novel in the Raven Riders series. The timeline takes place just a couple weeks after Dare and Haven's story left off. It also happens to be a second chance romance for Maverick Rylan and Alexa Harmon. This book turned out to be a bit more captivating than it's predecessor from this series. I connected with Maverick and Alexa much more than I did with Haven and Dare, and I was pleased to still see how their relationship was continuing while Maverick and Alexa found their way back to each other. What I liked most about the characters? Alexa's strength. Her story touches on an important topic of abuse, whether it be emotional, physical, etc. Her strength regarding her situation was admirable. I've come across so many stories where the heroine (despite knowing her Hero is there and offers his support/help) runs off half-cocked to save everyone. Alexa's maturity level was above and beyond that behavior and I absolutely loved it. Laura Kaye didn't send me in unnecessary circles while the female gets herself into more trouble. No, she left that to the villain. Her ability to accept the help Maverick and the Ravens offer -no matter how small- was perfect. Maverick. Oh, how I just adored him. When he was introduced in the first book and without having is back story, he came off a bit moody. Now, it's all clear why. The poor guy had his heart broken, yet despite that he still puts his heart and soul into the club and his family. He has just learned to live with the missing piece of his heart that was taken when Alexa left him. From the start, it was clearly evident that Mav wore his heart on his sleeve where Al was concerned. It was so sweet and endearing. It further proves just how soft and cuddly the Ravens are, despite being badass bikers. They're not bad guys and work hard to try and disprove any negative connotations that go with being in an MC. They serve and protect their community, their own motto is based on helping those that can't help themselves. I just love them and I love how Laura Kaye writes them in each story. How she manages to clearly explain the life in an MC, give me everything I need about the character and where they come from, as well as describe everything in a way that I can literally see it in my mind's eye; without getting me lost in too much detail. I look forward to more from the Raven's. "I know I want this. I want you, Maverick. Righ now. And wanting you feels like one of the smartest decisions I've made in forever. Everything else be damned." "'Lucy' is cute and all but it doesn't really fit our vibe. Or the sweater I bought you. Maybe Lucky or Bones or...Slugger. Right?" The cat purred and stared at him. "You like that idea, don't you? Yes, you do, kittykitty." "You are totally cooing at my cat right now." "I'm totally cooing at your cat." "You're my silver lining in the mess that is my life right now. It all brought me back to you, and I've never been more grateful for something in my entire life." "I need you. I need you every way I can have you." "Then have me," she whispered. He kissed her forehead and sighed, the sound full of satisfaction and ease even as his heart pounded under her hand on is chest. Or maybe that was her heart she felt, because he'd stolen it totally and completely. 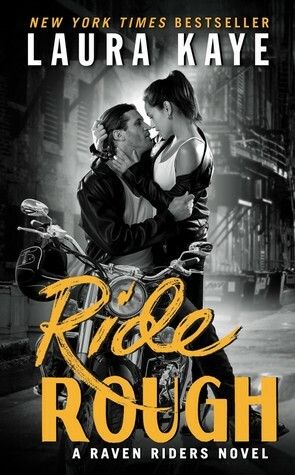 Sign into Goodreads to see if any of your friends have read Ride Rough.